Jose Mourinho is fuming. What’s new, right? Well, this time the Manchester United manager’s rage is probably justified because his side were robbed of a perfectly good goal during the first half of their Premier League match against Middlesbrough on New Year’s Eve. The score remained 0-0 at the interval, despite this kung-fu volley from Zlatan Ibrahimovic. Although United dominated, Zlatan was very quiet for the majority of the first half, before he rose like a man much younger than 35 to meet a cross from Anthony Martial, who had a superb opening 45 minutes. 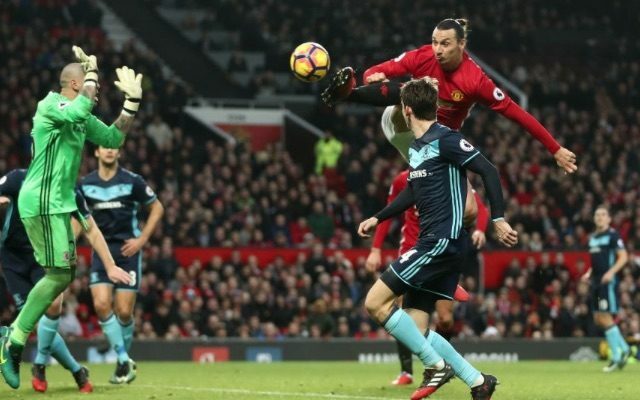 Zlatan got to the ball way before former United goalkeeper Victor Valdes, but referee Lee Mason ruled the goal out, citing dangerous play. Valdes stayed down for a long time too, which annoyed United fans, who clearly thought he was milking it. Mason and Valdes were then both subjected to boos from large sections of Old Trafford, with home supporters also calling the Boro no.1 a w*nker in a chant. United went on to win 2-1.